The strike, called by ten major trade unions, is protesting against the PM Narendra Modi government’s alleged anti-worker policies and unilateral labour reforms. The nationwide bandh called by central trade union will continue on Wednesday after witnessing stray incidences of violence in the first 24-hour of the two-day long bandh. The strike, called by ten major trade unions, is protesting against the Prime Minister Narendra Modi government’s alleged anti-worker policies and unilateral labour reforms. According to reports, nearly 20 crore workers of the state and central government are expected to join the nationwide strike which has been called by 10 trade unions. The strike has been called by a consortium of ten central trade unions and has received support from organisations like the AITUC, CITU, HMS, AIUTUC, TUCC, AICCTU, along with employees in the banking and insurance sector. Farm unions like All India Kisan Sabha (AIKS) cand Bhumi Adhikar Andolan are also part of the strike. The trade unions have supports of almost all major independent federations of central employees, state employees and the employees of banks, insurance, telecom, and other service sectors representing the workers and employees of all the industries and services including transport services, both in organised and unorganised sectors. The 48-hour-long strike appears to be having a major impact in Left-dominated states of Kerala and West Bengal. The strike is also quite visible in other states like Assam, Odisha, Meghalaya, Karnataka, Manipur Bihar, Rajasthan, Goa, Punjab, Jharkhand, Chhattisgarh and Haryana. Most of the schools in the state that had declared a two-day holiday ahead of the strike remained closed, while few opened on Wednesday. The trade unions on strike also held bike rallies in towns and cities waving red flags. State-run Karnataka State Road Transport Corp (KSRTC) operated about 3,600 of its scheduled 4,100 bus services across the state. Though, bus services in Bengaluru were fewer, with only 428 bus services plying across the city against the 4,100 scheduled, leading to a high demand for autos and ride-hailing services like Ola and Uber. There is no impact of the shutdown in Karnataka on the second day with government offices and bus services functioning normally across the state on Wednesday. A few hundred industrial workers, joined by Anganwadi workers and Accredited Social Health Activists (ASHAs), took out protest march from Town Hall in the city centre to the Raj Bhavan amidst tight police security. Kerala: A treasury branch of the State Bank of India in Thiruvananthapuram, Kerala, was attacked and trains were blocked in various parts of the state. The branch manager said a group of people came to his cabin at around 10 am and threatened the staff, damaged a glass table top and a computer. No additional police security was sought as the security staff was on duty, he said. At the Thiruvananthapuram railway station, Thiruvananthapuram-Hyderabad Sabari Express and Venad Express were blocked, while the Kottayam-Nilambur passenger train in Kalamassery was held up for a while. A Centre of Indian Trade Union (CITU) worker, who allegedly hurled stones at the BJP protest pandal here on Tuesday, has been arrested. In many places, shops and commercial establishments were remained shut. Buses and autorickshaws were also off the roads. Many shopkeepers alleged that they were asked to put down their shutters. Most of the textile and spices shops in the Broadway Market in Kochi and Mittayi Theruvu (sweet street) in Kozhikode were open. Sabarimala pilgrims, tourists, social and religious functions have been exempted from the strike. New Delhi: The workers participating in the strike will go on a protest march from Mandi House to Parliament and similar protests would be seen in other parts of the country as well. All India Trade Union Congress General Secretary Amarjeet Kaur told PTI that there will be a complete bandh in Goa and Bihar, while 100 per cent strike is expected in other parts of the country too. She said that due to UGC exams, which started from Tuesday, some state transport departments would not participate completely in the strike in the interest of students. The exams are scheduled in some states on Wednesday as well. The strike had received a mixed response on Tuesday. The educational institutes, rail, banking, postal and transport services are expected to witness disruption on Wednesday too. The unions have alleged that the government has failed to create jobs and grossly ignored unions' 12-point charter of demands. Farming communities, through their associations, have also extended support to the strike. Student and teacher organisations of various universities have also declared support, the statement had said. Odisha: The strike mostly affected vehicular movement at several places as the agitators resorted to road and rail blockades. They obstructed train services in Bhubaneswar, Balasore, Berhampur, Cuttack and many other places in the state. The agitators were seen picketing in Bhubaneswar. However, many vehicles were plying without any hassles in the capital city. The protesters also staged picketing at various public sector undertakings and offices. Schools, colleges and universities in several districts remained closed in view of the strike. "Our strike has been successful on its second day. 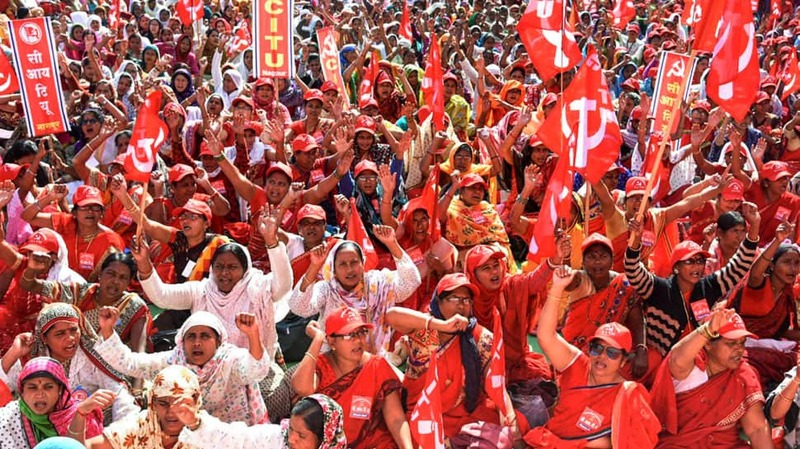 We are protesting the anti-labour policies of Narendra Modi government and the people are supporting our cause," said Sauribandhu Kar, state General Secretary of All India Trade Union Congress. Goa: Majority of the tourist taxis also remained off roads, causing inconvenience to visitors, especially those who wanted to catch flights from the Dabolim airport in Goa. Schools and colleges across the state witnessed thin attendance, as students did not venture out of homes due to unavailability of private buses, according to sources. Workers in many industrial areas also did not report to work, they said. Some government departments in the state capital Panaji also saw thin attendance. Suhas Naik, the convener of the Goa Convention of Trade Unions and Mass Organisations, said the strike was successful as people joined it voluntarily. "Everyone is affected by the central government's policies, and the response to the strike is an indication of this. A clear message should go to the Centre (leaders) that they need to correct their actions," he said. Goa: Normal life was affected in Goa as private buses and tourist taxis remained off roads. Long queues of passengers were seen at various bus stands after the private buses association in the state did not operate its services. To mitigate the woes of passengers, the state-run Kadamba Transport Corporation was operating 800 additional bus services, a senior official of the corporation said. Some people living on islands in the coastal state also faced problems as ferry boat services run by the government's river navigation department remained shut. "Despite the state government having invoked the Essential Services Maintenance Act (ESMA), the ferry boat operators have not reported to work. People living on islands cannot go to the mainland even in case of an emergency," social activist Jerry D'Souza, a resident of the Diwar Island near Panaji, said. He demanded that the state government take a firm action against the river navigation department employees supporting the strike. West Bengal: Protesters vandalised a government bus in Dinhata, Cooch Behar District. At least two people, including the bus driver have been injured. Police is present at the site where the incident took place. West Bengal: Two students injured after protestors participating in strike pelted stones at a bus at Shanpur Mor on Jhikira-Howrah route. West Bengal: CPM leader Sujan Chakraborty along with other protestors in Kolkata detained by police while they were participating in the strike. West Bengal: Train services on Sealdah-Lakshmikantapur Namkhana and Diamond Harbour section affected as strike supporters have thrown banana leaves on overhead wire at Dakshin Barasat, Mathurapur between Nischindapur-Kakdwip, Kakdwip-Namkhana on Sealdah-Lakshmikantapur Namkhana section. Banana leaves have also been thrown at and Basuldanga on Sealdah-Diamond Harbour section. Tower vans have already been dispatched to remove the banana leaves from the overhead wire to restore normal services. Normal services are maintained over other sections of Sealdah division. The Odisha Government has directed the District Collectors and District Magistrates to assess the situation in their respective district and decide accordingly for the closure of the educational institutions. In a letter written to district officials, Additional Secretary, Partha Sarthi Mishra ordered for necessary caution. "During `Bharat Bandh` call on January 9, there may be apprehension of untoward incidents in different parts of the state. Hence, you are hereby requested to assess the situation in your district and in case there is any compelling situation which is likely to affect the Educational Institutions, you may kindly take a suitable decision for closure of the educational institutions within your jurisdiction," read the letter. The strike also disrupted rail and road traffic in Odisha. Train services were hit as trade union activists staged rail roko at places like Bhubaneswar, Cuttack, Puri, Balasore, Jaleswar, Bhadrak, Sambalpur, Berhampur, and Paradip. Meanwhile, in Rajasthan, 22 policemen were injured following clashes at the manufacturing plant of a Japanese company as workers, who were supporting the stir, tried to enter its premises, police said. Union leaders claimed that 50 workers injured in the police action against protesters. In West Bengal, clashes between Trinamool and CPM workers was reported in Asansol. There were also incidents of stone pelting at a school bus. Protesting members burnt effigies and tyres on streets in some parts of the state including Kolkata. They also blocked railway tracks in some part of West Bengal, delaying some long-distance trains. Daily life was affected Left-ruled Kerala with schools and colleges being shut and banking services being affected. Trains were stopped in Kerala while buses and autorickshaws were off the road, hitting normal life, according to reports from the state. Workers from various sectors have extended support to the two-day strike. Karnataka evoked mixed response while other states saw business as usual. The 'hartal' was also quite visible in Assam, Meghalaya, Karnataka, Manipur Bihar, Rajasthan, Goa, Punjab, Jharkhand, Chhattisgarh and Haryana - particularly in the targeted industrial areas and different mines, said Amarjeet Kaur, General Secretary of All India Trade Union Congress (AITUC). The first 24-hour of the two-day long bandh witnessed stray incidences of violence in West Bengal. However, daily life was affected in many states with the transport department, taxi drivers and auto-rickshaw drivers supporting it. Two leading bank unions also joined the strike partially affecting banking operations. In Mumbai, over 32,000 employees of Mumbai's civic transport undertaking went on an indefinite strike to demand higher wages. The protest, which coincided with the two-day strike called by 10 trade unions, affected nearly 25 lakh daily commuters.